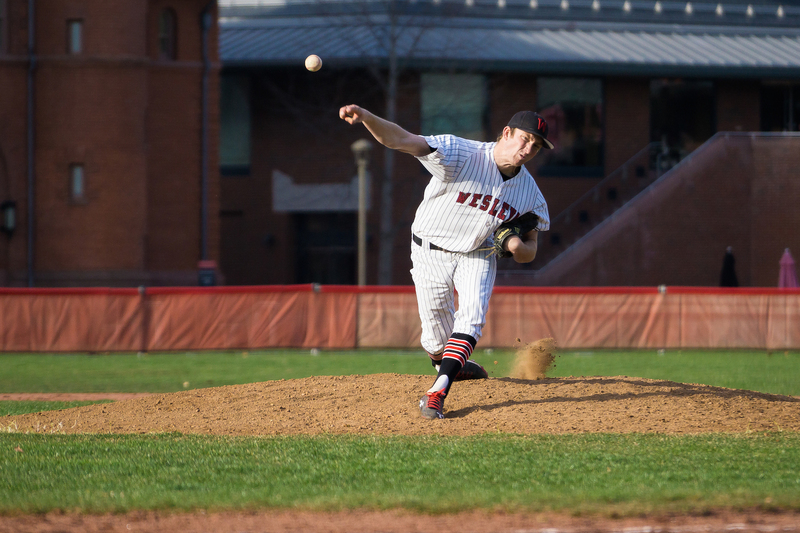 As two-time defending NESCAC champions, baseball entered the spring under perhaps more pressure than any other athletic team. Over its annual season-opening, rapid-fire stretch of games in Tuscon, AZ, the team more than lived up to expectations. Wes left Arizona with a 9-3 record, its best such mark in recent history. On Thursday evening, the Cardinals’ home opener ended in a win over Coast Guard Academy, improving their record to a strong 10-3. Despite the overall success of the trip, the team was forced to overcome a rocky start in its first game against Hamline University. After throwing a flawless first inning, starting pitcher Michael McCaffrey ’19 was shelled in the second. Wilson Flower ’16 and Ethan Rode ’17 fared a little better in relief, but Hamline had already put 24 runs on the board by the end of the third. When the game mercifully concluded, Hamline stood on top by a disappointing 29-14 margin of victory. The concerns over this inauspicious beginning quickly dissipated, as the Redbird bats stayed hot while the pitching staff began to settle in. The Cards went undefeated over their next four games, with pitchers Peter Rantz ’16 and Asher Young ’17 winning one game apiece to supplement two wins from Nick Miceli ’17. A pair of the wins came against Bethany Lutheran College, with the other two occurring against Aurora University and Marian University. Jordan Farber ’16 had a particularly hot bat, going 7-13 with the team’s only home run of the stretch. The day after defeating Marian, the Red and Black split a doubleheader, first falling to University of La Verne but then topping University of Wisconsin-Superior in extra frames. Rantz threw six dominant innings against La Verne, but Young could not hold onto the lead in relief as the Leopards were propelled by a big eighth frame to a 7-5 victory. Against the Yellow Jackets, Wesleyan’s pitching was strong but was failed by defensive miscues. First-years Dan Lombardo and Doug Hartshorn were sharp, combining for just two earned runs over the first five and two-thirds innings. However, these two earned runs translated to eight total runs on account of seven Cardinal errors. A solid offensive output kept the game tight, highlighted by four hits from Andrew Keith ’19 and a pair of extra-base hits from Eric Jones ’16. A sac fly in the top of the ninth by Miceli scored Cyrus Rothwell-Ferraris ’18 to extend the game to extra innings. Then in the 11th, Miceli used a sacrifice bunt to score Farber after the latter tripled. Miceli then came out on the mound for the bottom of the inning, and blanked the Yellow Jackets to secure the win. The next day, Wesleyan and Wisconsin-Superior squared off again, with Wesleyan this time taking a more decisive 10-1 victory. Rode was dominant on the bump, throwing eight innings of one-run baseball while picking up his first win of the season. Days later, the Cardinals picked up their third and final loss of the road trip to Macalester College. Ellis Schaefer ’17 sparked a rally in the ninth to stretch the game to extra innings, but Rantz surrendered a run in the tenth and the Scots held on for the win. The following day, Wesleyan took in California Lutheran University and Carleton College in a doubleheader. Rantz earned the win in a back and forth contest against Cal Lutheran, and Miceli helped out with a two-inning save. 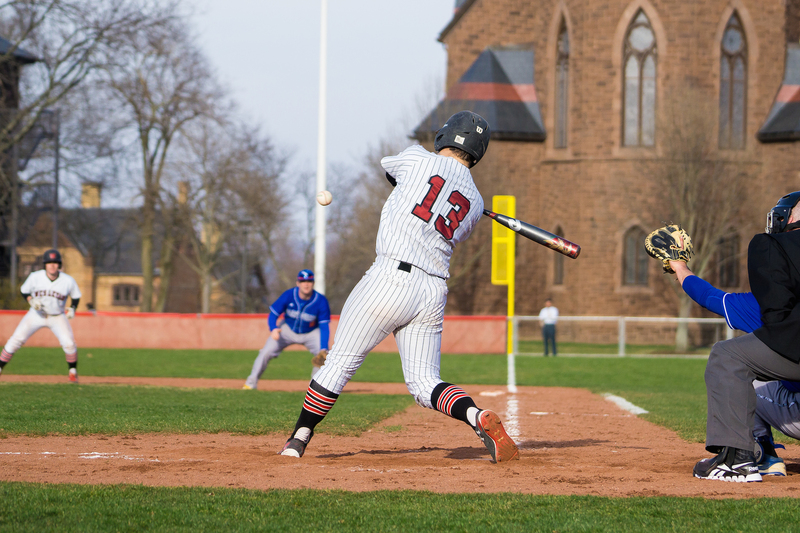 Marco Baratta ’16 ignited the Red and Black offense in the game with a double and a triple. Later in the day, McCaffrey tossed a complete game gem in a lopsided seven inning contest, surrendering one run on four hits and striking out ten. Carleton’s starting pitcher gave up 12 runs over two innings of work, many of those coming off the bat of Guy Davidson ’16. Davidson was 3-3 with 6 RBIs and was hit by a pitch in each of the first two innings before hitting a three-run blast in the fourth. In an impressive effort in each facet of the game, Wesleyan rolled to a 19-1 victory. For last game of the trip, the Cards held a rematch with Macalester. Rode pitched six and a third while giving up just one unearned run, and was supported by Miceli, who threw the other two and a third innings without allowing a hit. On offense, Keith had another four-hit game and scored two of Wesleyan’s five runs. Upon returning to campus, the team stayed hot with an 11-5 win over Coast Guard. Miceli and Matt Jeye ’18 starred in the contest, with Jeye homering early to put the Cardinals ahead. Meanwhile, Miceli threw four and a third lights-out innings to pick up the win, while also collecting two hits and swiping two bags. Flower was encouraged by his team’s start to the season, though he knew that the team has potential to improve. Flower also was willing to point out some of the team’s weaknesses, but laid out a concrete reason for the struggles and plan to address them. Jones also was positive about the direction of the team.